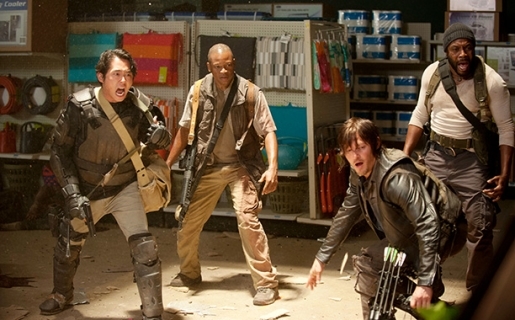 Grocery shopping after the zombie apocalypse in The Walking Dead’s 4th season premiere. It’s beginning to be a theme regarding the television show The Walking Dead. It seems like every season the ratings just keep going up and up, with no end in sight. Don’t believe me? Record ratings in the first season. Record ratings in the third season. And now, record ratings in the fourth season. The Walking Dead debuted on Sunday night to a staggering 16.1 million viewers, scoring a mind-bending 8.2 among viewers 18-49, television’s most important demographic. If you combine every other broadcast show on Sunday night, they don’t match up to the ratings for “30 Days Without An Accident.” Perhaps as important, The Walking Dead‘s success spread throughout the line-up for AMC; Talking Dead‘s debut also scored record ratings, bowing with 5.1 million viewers and 3.1 million viewers in the 18-49 demographic. AMC says the program is the highest-rated program to air this fall, even beating sports programming! “Sincere thanks to the fans, who have welcomed The Walking Dead back for its fourth season with the highest-rated episode in the show’s history,” said Charlie Collier, AMC’s President.